Keep your entire family's winter gear safely stored in one compact and convenient location. This combination storage rack is designed to hold sets of skis and snowboards at the same time, and it will separate and organize them off the floor and out of your way. Not only will this allow you to consolidate your equipment, and free up floor space in your garage, it will also protect and preserve your equipment so it will last longer, and work better each time you're on the mountain. The durable materials ensure that this rack will last much longer than the equipment it is meant to store, and it is rated to handle up to 200 lbs. so you can easily load it up without worry. Place up to three sets of skis and four snowboards without it becoming too cluttered, and you will even have room for the poles. Don't have that much stuff? Use extra hooks to dangle boots, or hang helmets and you can easily utilize the full rack. Each hook can slide into any position along the bar, and they are all coated in a rubbery material in order to increase the grip and ensure that no damage is caused. All hardware necessary for installation will come with this set, and most folks can complete the simple installation process in about fifteen minutes. Complicated would not be a good word to describe the installation process for this rack. By following a few simple steps, just about anyone could have this storage unit operational in under fifteen minutes. The most difficult part will be scouting the location to decide where the brackets will go, and mounting them up high enough so that there is ample clearance for your skis to hang. Because it will be supporting a decent amount of weight, it is important to screw into a stud or something else similar, so after you choose a general location, bust out your stud finder to pinpoint where the brackets will be mounted. Use a pencil to mark where the holes are by using the bracket as a guide. After that, set the brackets down, drill guide holes for both sides, then take the screws that were included and secure the brackets to the wall. Once those are up, simply insert both ends of the bar through the corresponding holes on the brackets and you will be almost finished. A simple action of pressing down a metal button will allow you to slip the bar in, but then it will pop up, to keep it in place. After the bar is in place, check to make sure it is level, and then begin adding the hooks. The smaller ones will be used for your skis, and the larger ones are meant to support your boards. Each one can be positioned anywhere along the bar, and they are all coated for added protection. Once installed, simply pile on your gear and forget about it because it will be totally secure, and nicely organized. Whether you want to clean out your garage and keep things less cluttered, or you just want to give your expensive equipment the home it deserves, this rack would be an excellent choice. It's ability to hold both skis and snowboards makes it ideal for active families, and the perfect way to consolidate that jumbled pile of equipment you are struggling with now. When all of your stuff is neatly arranged instead of tossed or leaning, you will decrease the mess, and free up more usable space. As it is held securely off the ground, and separated from other equipment, it will be better protected against accidental damage or other factors like moisture and dirt. Keep all of your equipment right next to your vehicle to make a speedy retreat, or organize it out of the way on the wall of your basement, shed or attic. Everything will be highly visible and easy to retrieve, and you will never have to worry about something catastrophic happening when it's not attached to your feet. Order Yours Today! 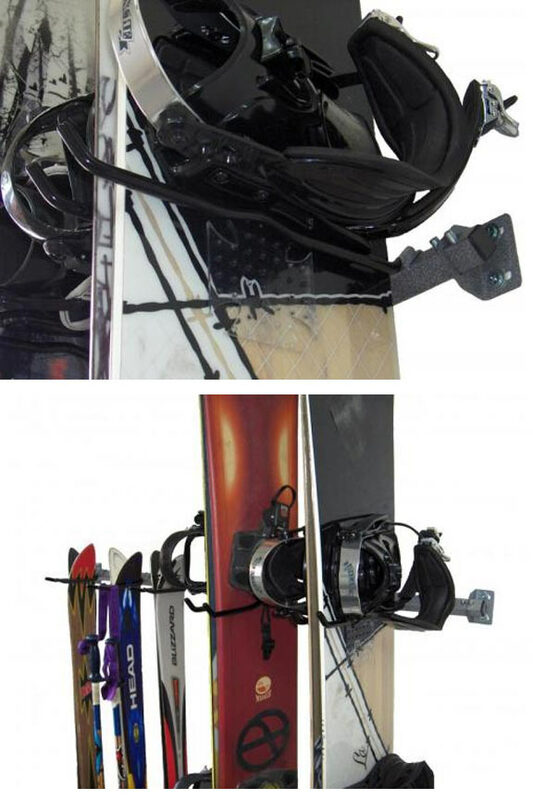 Uses Store snowboards and skis together in one convenient location. Keep equipment organized and off the floor to prevent damage and reduce clutter. Compatibility Will hold 3 sets of skis with their poles, and up to 4 snowbaords at once. 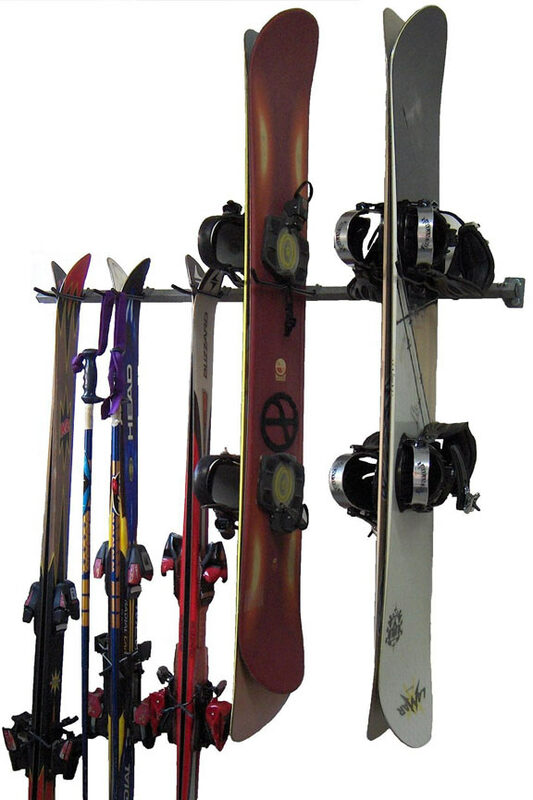 Combo Storage Rack For Skis And Snowboards - Perfect for the family with varying interests, this rack holds snowboards and skis in one compact and organized spot. Reduce clutter in your garage or shed as you free up extra space and protect your equipment from damage. Order Yours Today!